Santa was pretty busy yesterday in Toms River! 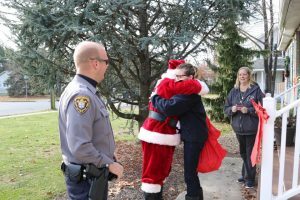 He visited Silverton EMT Megan who suffered a near fatal cardiac arrest in September! 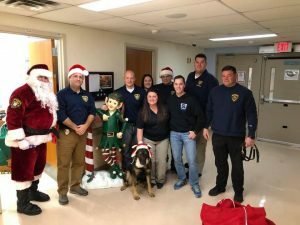 Santa then visited Children’s Specialized Hospital and gave out toys to all the children; a tradition that was started by Michelle Yannacone and Chris Anderson years ago. Santa also gave CSH a $1,000 check from Lucky Leo’s Amusements. 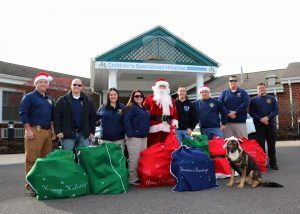 Finally, Santa stopped by Big Brothers Big Sisters of Ocean County NJ and dropped off a plethora of toys for the children enrolled in their mentor programs including Toms River Police Department’s Bigs in Blue Program. We should never forget that even on our worst days, there is always someone who has it worse than we do! Special thanks also to Chris J. Nolze, Toms River Blackhawks and Lucky Leo’s for the toy donations! Have a happy, healthy and safe holiday season!